Posting has been a little late today as the server has been unavailable for some unknown reason. Still, it’s fixed now or appears to be. I had a call earlier from the BBC, Radio Kent’s Pat Marsh Show. Apparently, they want to have a quick look at the “Blogging” phenomenon at 10:30 am on Monday and have honed-in on this one for an interview. 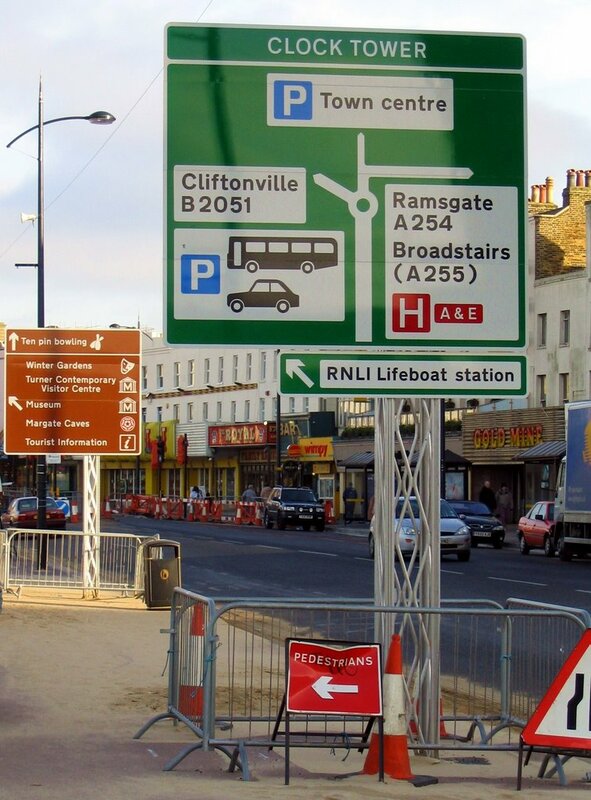 Mind you, if we knew who the mysterious “Eastcliff Richard” was, I’d recommend him instead, as his is much funnier than mine and you can’t have enough coverage for Ramsgate as the millionaire’s playground of the south-east. Mind you, I had a look at one of our other local “chat” sites today which has a “name and shame” feature and I was alarmed at some of the content, which wouldn’t be permitted under the site rules here and which sails very close to the libel laws. Most recently, someone there was accused of having “Aids” and I believe that there is a real danger of some people misunderstanding the nature of free speech in regard to the law. On another note today, I suppose that if you wish to sum-up politics today, then read the news that during the last election, Cherie Blair spent £7,700 on having her hair prepared by a personal stylist, which says it all. In her role as Ms Booth, a high court judge, Cherie rumoured to earn as much as £700,000 a year – not including speaking and appearance fees but it’s convenient that when ‘Bad hair day’ arrives, the Labour party will pick up the bill. Now I’ll lay odds that John Prescott’s wife – she of the really big hair – may have run up a similarly large bill, allegedly but that has yet to come out in the wash. – That’s a pun! A Labour spokeswoman said: "So what? We won the election." I wonder how our very own New Labour – New Hairstyle, Iris feels about this use of party funds. Did Thanet have a hidden political hair-care fund during the last election? 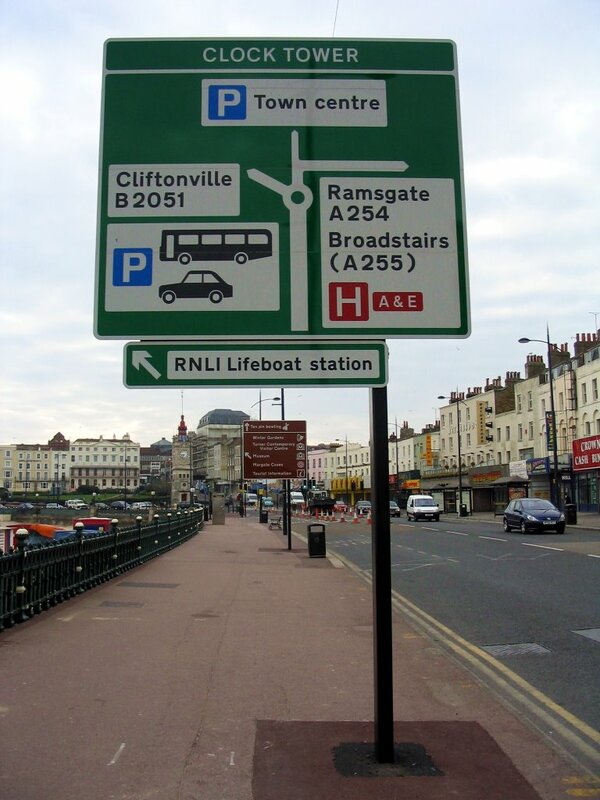 However, Cllr Clive’s original request, made during a debate last year at County Hall, was for the supports and signs to be replaced with more appropriate designs given the seafront location and the negative impact on people entering the town. Cllr. Hart said “I have to say I’m somewhat bemused by the way this matter is being dealt with by KCC. The removal of the scaffold-like structures will undoubtedly help with the free flow of pedestrians along the promenade and I’m very thankful for that. " His objection to the actual post itself I can understand, though a reader here did point out what the posts were for (safety in the event of a car crashing into them, which is sadly all too possible). He has a point about the Caves but as he can see on the photo, its about the TC Visitor Centre, not the TC itself. The signs must be clear to passers-by, which explains their size. Many of the people who come here dont know where things are and need directions. Perhaps he would share with ThanetLife his ideas for new signs to replace the ones currently there? As for the comment about the last election, well she did touch up her photo on the election literature to make herself look better. am i the only person that thought the posts looked good? something a little different from the normal single poles they have now been replaced with! No, I agree with you, the posts were fine as they were. I have no problem with them changing them back though to a single post. It was a matter of safety as someone pointed out. I dont care too much about asthetics. Its a post for holding up signs. I would have preferred for them not to have been changed back to a single post (cost, time, effort, it all builds up) but Cllr Clive Hart kicked up the fuss. Actually that would be interesting to find out. How much has it cost to remove the "scaffold" style posts and replace them? Was it really worth it? I know the site too, there's some bloke there who goes on and on about taking the police to court all the time! I am aware of that site too Anonymous 3:18. It seems that every topic manages to get twisted into an indecipherable and unanswerable converastion killer. It used to be a great little site which had a much better community feeling than Thant Life has. Unfortunately I think it has suffered from a lack of moderation which in my opinion was because the creator (with all the best intentions) just set it up and trusted posters to behave themselves. Oopsy. How on earth did we survive before all this sign posting? These signs spoil views are intrusive and out of character and live up to the description of " viual pollution". However, what should we expect when visual pollution is not an understood concept by KCC roads and our myopic councillors at TDC. I liked the sign posts too! I thought they were a little trendy, and probably detracted from the overly large road signs! ...or is it incase we wanted to launch a rescue of the Turner Centre whilst the lifeboatmen did real missions? Aso - before someone says its a tourist attraction, if that is the case, then it should be on a brown sign. 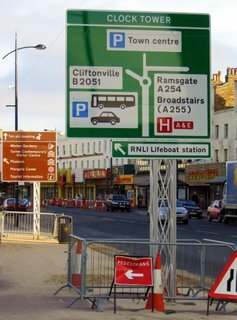 Ive driven from Margate to Westgate every day this week, and can you believe it, i've missed those signs!!! And the reason? Well my concentration has been taken up trying to count the number of 'occupied' carriages on the Big Wheel & how many of each colour there are, and why it still goes round even when its empty ..... how sad i must be - I'll look at the signs next time!! Asked my Year 10 Geography set how many of them went down to Dreamland over the Easter Holiday and quite a few had; general consensus was " big wheel was good but there aint nuffink else there, Miss" So it would appear that with the season started and May Bank Holiday next weekend that like the summer swallow "one big wheel does not a theme park make". Beware of the self fulfilling prophecy that " should an Amusement Park not be viable ........". Returning to the subject of the signs, when will our elected representatives realise that they wont beat the officer regime (County or Thanet) once the officers have made a decision. As a former Member myself I remember only too well a senior officer stating, "Members come and go, but officer are here for the duration". In other words, Members are merely a transient irritation, to be kept in the dark and played with. You could pretend that Cllr. Hart got his way, but what a ridiculous charade and at what cost, when the self same signs got re-fitted to the new supports. I thought it was the signs more than the posts which were out of keeping. This has got to be the most alarmimg post I have seen for a long time, Anon of 7.39pm. Are you really saying that unelected officers run Thanet? Anon of 3:44pm. May I suggest that you go along to a few committee meetings & judge for yourself!!! If you're lucky, it might be more entertaining than the TV but don't get too wound up, otherwise you could end up with depression and hang yourself! The best antidote when you get home is a dose of Eastcliff Richard! Joking appart, fortunately or unfortunately depending on your experience, it is very much true. Unelected officers do not run Thanet. The Officers run TDC and provide the information for the Councillors to make the decisions on. There are some people here who are so hurt by the decision over Two Chimneys which was fairly made, that they turn against the Council and feel the Council can do nothing at all for them, which is a shame and rather a defeatist attitude to take. The Council made its choice as it has to. The Council is not there to do a popularity contest. Its there to make tough decisions that affect the area. It decided on that occasion that the case in favour of the application was stronger than that against it. James,with the greatest respect, you are a young man and showing great nievety yet again. You are totally incorrect. I have very little interest in the two chimneys application other than the application of planning policies and enforcement of conditions. You need to go to a few more committee meetings, or better still use your enthusiasm, and stand at the next election! Not hurt by the decision, James, utterly flabbergasted. A friend gave me a thick wad of the agenda and supporting documentation of the meeting of 19 Apr. As you were there you might like to consider why a fully screened site (Wayside, Minster) with a modest expansion of 0.3 hectares and only involving 15 new mobile homes was discussed in some detail and referred to the FULL Council for it to make the final decision whilst an expansion 15 times greater and with the previous expansion unenforced and not planted and visible in a 270 degree arc on all approach roads was approved with minimum discussion. Why wasn't 2 Cs referred to a full council meeting? One interpretation for one modest site and another for a huge site? It strikes me as a very odd way of conducting council business. James...do politics is one big popularity contest! It's like Pop Idol, but without cameras and We are all the Simon Cowells. Councillors will do what THEY believe is best, hoping that it will win them a vote or two next time around. That may sound pesimistic, but unfortunately true! I also think if 2C's was on a Coucillors back yard...it wouldn't get the time of day - regardless of what any officer sys! "It's like Pop Idol, but without cameras and We are all the Simon Cowells". Nice analogy, though it is a prevalent one. Down here in Salmestone there is that view of politics. This is largely due to the lack of active leadership by our elected representatives. Those who stand in next years elections need to be fully prepared for the job, being preferably local residents having experience in what issues are involved in the ward with the energy and maturity to represent all residents effectively. TDC definitely needs an injection of fresh blood. As I have said before, the elections will be about the future of Thanet. As to whether I would want to be part of it, yes. Whether I will actually stand...ThanetLife will know first when Ive decided.